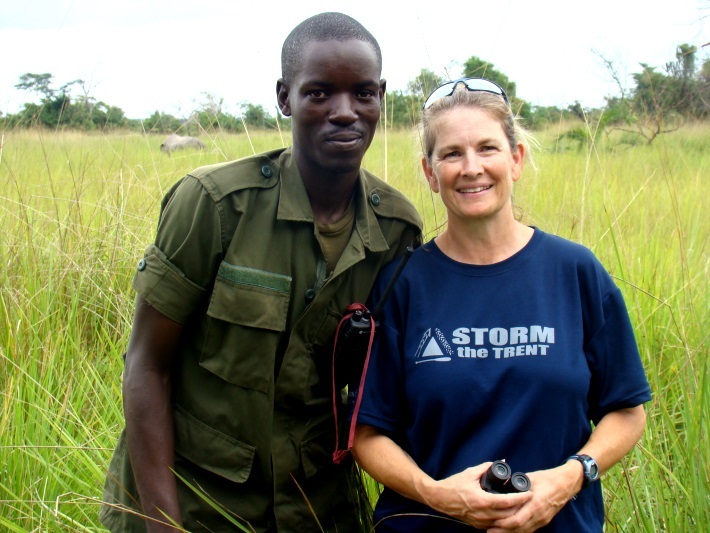 Mandy Hathway has recently returned from Uganda, where she spent 2 weeks on our rhino conservation project. Read on to find out more about her amazing experiences. In 2017 I received a message from Oyster Worldwide about a new volunteer opportunity in Uganda. Previously I had done a volunteer trip to Romania to the bear sanctuary ad had a fabulous time and it was very well organized. After several emails back and forth with Anne (Oyster) and Kombi Nation Tours regarding my plans, it was all booked. I arrived few days early to recover from jet lag, and enjoyed 3 days in Entebbe. During those days I stayed at the Airport Guesthouse which was fantastic. I went on excursion to the Ngamba Island Chimpanzee Sanctuary which was well worth the money (this was an additional cost to me and arrangements made ahead of time). I also wandered around the Botanical gardens and just around the local shops and then found a great café called Anna’s just around the corner form The Airport Guesthouse. Day 4 I was promptly picked up and on my way to the sanctuary…it was a 4 hour drive with a brief pit stop along the way. Upon arrival I was taken to my room which was very nice and then to reception to meet another volunteer. She was able to fill me in on a few things and introduce me to staff at the accommodations and then I was whisked off for orientation. My orientation was with Moses and Thomas and it was very informative. I never knew the difference between black and white rhino..now I do!!! I was also given my daily schedule which was a variety of maintenance, bird, plant and bushbuck identification and rhino monitoring. The evening gave me time to relax, get my bearings and figure out my clothing! My room was far more spacious and nice than I expected as a volunteer, so I could spread out and figure out what I packed where so I could start settling in to my volunteer time. The next day started with a great breakfast (excellent coffee), more tips from the other volunteer and then I was whisked off by Siya to meet up with the rangers to monitor Laloyo and her baby Madam. 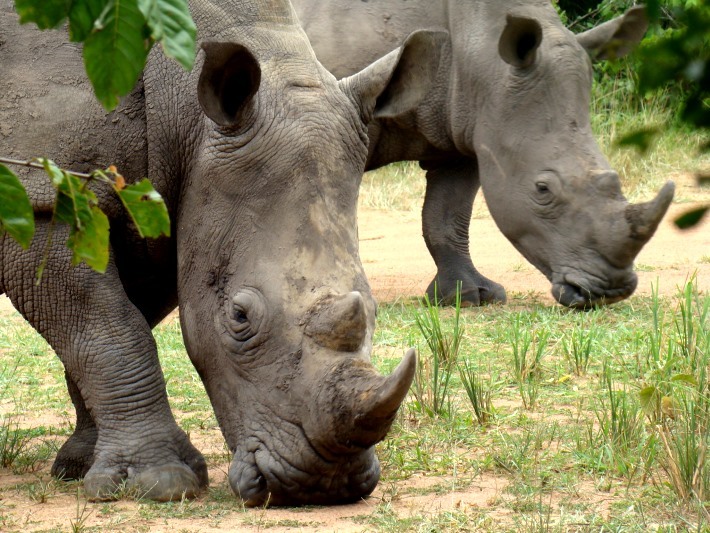 All the female rhinos and their youngsters, are monitored 24/7 by 2 rangers from the sanctuary. The rangers were fantastic and getting me within a safe distance to see the Rhinos…how magical! They also answered any questions I had about them and what they were monitoring, as well as any questions I had about the sanctuary, birds, plants and other animals that they were able to answer. After 4 hours watching and following them I was whisked back to the lodge for a nice lunch and some rest time. The afternoon I was off too……and then another evening of good dinner and relaxation before heading to my room for the night. I was tired after my first day as it was hot but it was so well worth it-I slept great that night and looked forward to the next 8 days of adventure! The following days were a mixture of Rhino monitoring, Bull rhino tracking, problem plant removal (great exercise), painting outdoor play equipment at the school with other volunteers and the managers, bird Identification (visual and by sound-Martine is so good at this!) and Bushbuck research. 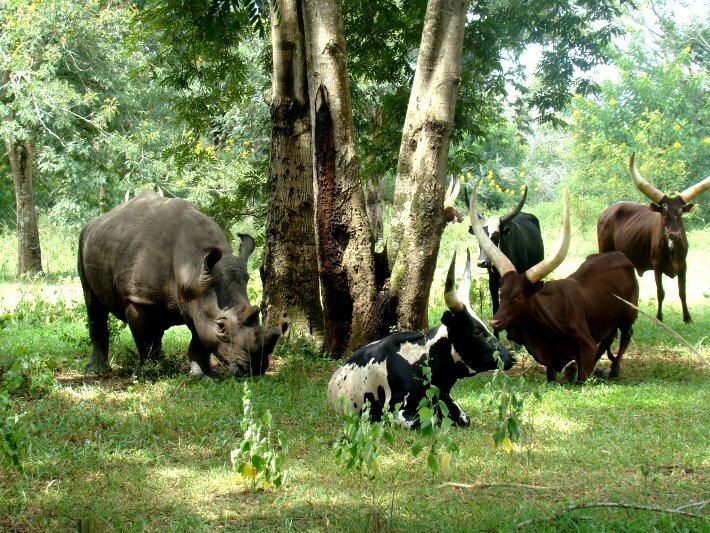 I learned a lot, not just about the sanctuary and the animals but also the people and Uganda in general. All the rangers were great to talk with and share their life stories. The staff and managers at the Lodge were also wonderful…everyone sharing stories and always looking out for the volunteers. Presently the volunteers stay at the Lodge, when there is room, as sometimes it can fill up with travelling guests that are on their way to Murchison Falls. Each day was a new adventure and I loved it!